Pinnoite: Mineral information, data and localities. Named in honor of Johann Friedrich Hermann Pinno (16 March 1831, Kleinkamsdorf, Prussia, German Empire - 6 September 1902, Berlin-Charlottenburg, German Empire), Chief Councillor of Mines, Halle, Germany. This page provides mineralogical data about Pinnoite. Crystals short prismatic , rare. 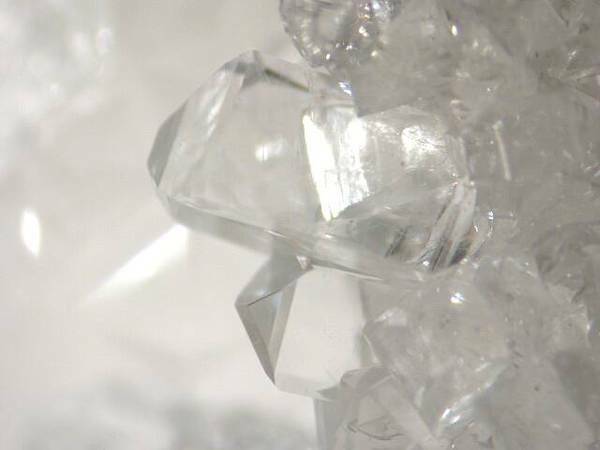 Commonly crystalline, fine-granular to faintly fibrous. 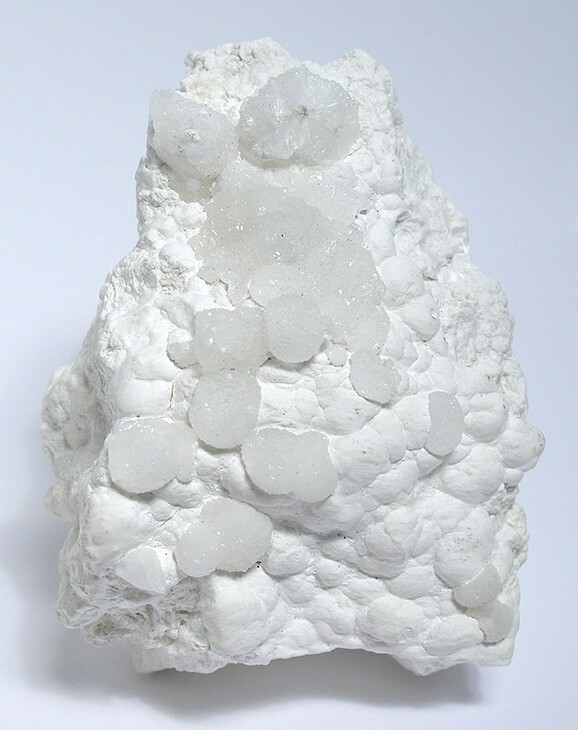 Nodules with radiated fibrous structure and a crystalline surface. Upper Kainite layers of a salt deposit. Staute, H. (1884) Pinnoit, ein neues Borat von Stassfurt. Berichte der Deutschen Chemischen Gesellschaft: 17: 1584-1586. 6.BB.10 Pentahydroborite CaB2O(OH)6 · 2H2O Tric. Soluble in dilute acids. Dissolves in boiling water with the formation of an alkaline solution with a flocculent precipitate which re-dissolves upon cooling of the solution. 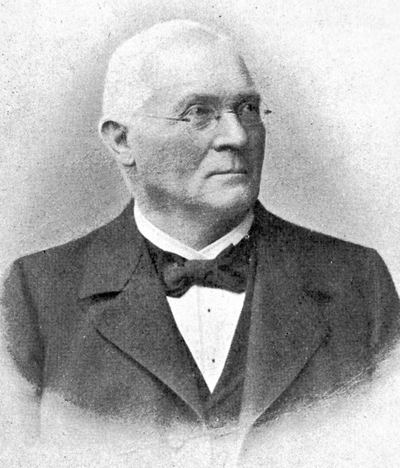 Luedecke (1885) Zeitschrift für Naturwissenschaften, Halle: 58: 645. Boeke (1910) Centralblatt für Mineralogie, Geologie und Paleontologie, Stuttgart: 531. Goldschmidt, V. (1920) Atlas der Krystallformen. 9 volumes, atlas, and text, vol. 6: 155. Stadler, H.P. (1947) The Cell Dimensions and Space-Group of Pinnoite. Mineralogical Magazine: 28: 26-28. Palache, C., Berman, H., Frondel, C. (1951) The System of Mineralogy of James Dwight Dana and Edward Salisbury Dana, Yale University 1837-1892, Volume II. John Wiley and Sons, Inc., New York, 7th edition, revised and enlarged: 334-335. Paton, F., MacDonald, S.G.G. (1957) The crystal structure of pinnoite. Acta Crystallographica: 10: 653-656. Krogh-Moe, J. (1967) A note on the structure of pinnoite. Acta Crystallographica: 23: 500-501. Genkina, E.A., Malinovskii, Y.A. (1983) Refinement of the structure of pinnoite: Location of hydrogen atoms. Soviet Physics - Crystallography (Krystallografiya): 28: 475-477. Strunz, H. (1997) Classification of borate minerals. European Journal of Mineralogy: 9: 225-232. Alonso, R. N. (1999). 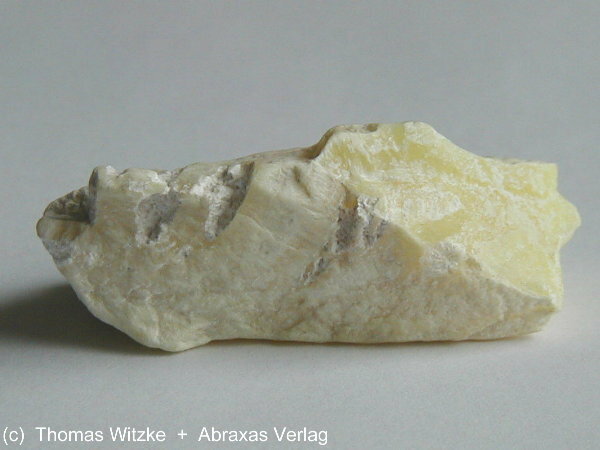 On the origin of La Puna borates. Acta geológica hispánica, 34(2), 141-166. Keqin Cai and Ziqiang Qian (1982): Acta Mineralogica Sinica 2(4), 290-295; Shaoxiu Yang (1991): Journal of Lake Sciences 3(1), 1-10; Garrett, D.E. (1998): Borates: Handbook of deposits, processing, properties, and use. Academic Press (San Diego, London), 491 pp. ; Qingzhong Wang, Yingkai Xiao, Chonggeng Zhang, Haizhen Wei, and Zhiqi Zhao (2001): Bulletin of Mineralogy, Petrology and Geochemistry 20(4), 344-366; Zheng, M. P., Qi, W., & Yuan, H. R. (2005). Characteristics of salt lake boron deposits and magnesium borate deposits of the Qinghai-Tibet Plateau, China. In Mineral Deposit Research: Meeting the Global Challenge (pp. 1123-1125). Springer Berlin Heidelberg. Palache, C., Berman, H., & Frondel, C. (1951), The System of Mineralogy of James Dwight Dana and Edward Salisbury Dana, Yale University 1837-1892, Volume II: 334. Palache, C., Berman, H., & Frondel, C. (1951), The System of Mineralogy of James Dwight Dana and Edward Salisbury Dana, Yale University 1837-1892, Volume II: 368. Milch, L. (1891): Über ein neues krystallisiertes Borat von Stassfurt.- Z. Kryst. 18, 478-480; Palache, C., Berman, H., & Frondel, C. (1951), The System of Mineralogy of James Dwight Dana and Edward Salisbury Dana, Yale University 1837-1892, Volume II: 334-335. Luedecke, O. (1891): Über Heintzit, ein neues Borat von Leopoldshall.- Z. Kryst. 18, 481-485; Palache, C., Berman, H., & Frondel, C. (1951), The System of Mineralogy of James Dwight Dana and Edward Salisbury Dana, Yale University 1837-1892, Volume II: 334, 368. World of Stones #1; Evseev, A. A. (1995) Kazaknstan and Middle Asia. A brief Mineralogical Guide. World of Stone 8:24-30; Pekov, I. V. & Abramov, D. V. (1993): Boron deposit of the Inder and its minerals. World of Stones, 1, 23-30.